What are the benefits of being a financial member? How does my membership fee get allocated? Why did the membership fees have to go up? The 2014 model introduced a lot of free memberships into the sport which were designed to increase participation. It was thought these people would transition into paying members but that did not happen. Therefore the financial performance of ESNZ Central deteriorated to the point that it could not finance its operations. Management and the board have made some hard calls to turn this around, staff have not been replaced, costs have been cut dramatically and we have had to spend a lot of time on grant funding and other ways to bring in money. We understand it is difficult for some to pay the increase but the casual membership fee should help some of those people. Have horse registration fees gone up? There is no increase in horse registration fees for 2017/18. This amount has not changed and remains at $75 to register a horse/pony. What classes can I compete in if my horse is unregistered? Can I get refund on my memberships or registrations? ESNZ has a no refund policy found here. How do I know when my membership/registrations expire? You will receive a renewal notice 30 days before your registration/membership is about to expire. Can I renew my membership/registration online? Yes, you can log in and complete all registrations online. Credit card (2.5% credit card transaction fee applies). Cash (only if paying at in person at National office). 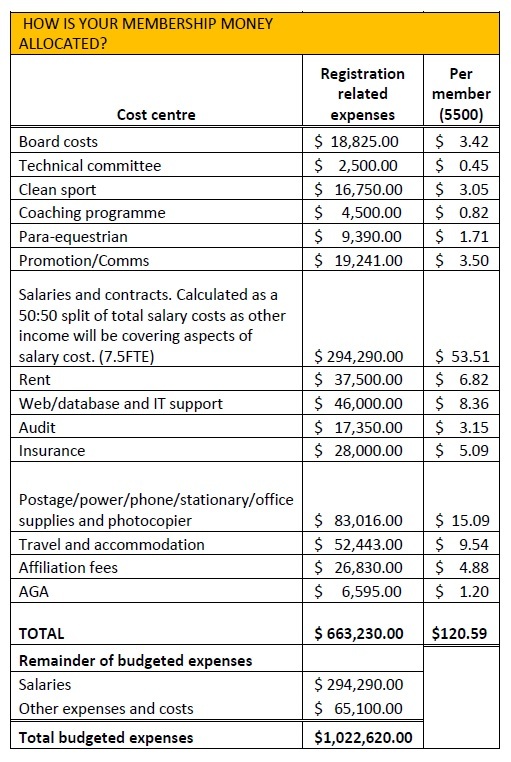 Is the ESNZ equine casual registration fee per day, class or show and how much is it? My Equine is fully ESNZ registered with a jumping annual start; can I add an Eventing annual start half way through my registration period? Yes however this will expire at the same time as the original registration and you will have to pay the full annual start fee, regardless of when you add this. If I choose to use a flexi discipline start what can I compete in? At what level do I need to fill in an ID Page and does the vet need to fill this in for me? This needs to be filled in for all fully registered equine. All ID pages required for ESNZ registration can be filled out by an owner/rider/person responsible over the age of 18. All ID pages required by the FEI (i.e. Passports) are required to be filled out by a Vet. Is there a different membership for ponies/horses? No as of the 1/8/2014 there will be an equine registration option only (Registered, casual and unregistered). Does my pony require a current height certificate to be registered? Yes all equines 148cm and under must have a current height certificate provided with the registration paper work, regardless if this is a new registration or renewal. I have just brought a horse. Can I change this into my name? Yes providing you have completed a change of ownership form with the previous owner’s signature on it. To be the principle owner of an equine you must be a financial member of ESNZ. What if my horse is owned by a syndicate of 2 or more? One person must be listed as the primary owner in our system. This person must be a financial member. I am a volunteer at shows at what point do I need to be a member? All listed officials including stewards. Volunteers who work at the shows do not need to be members if they are working for the organising committee under the event health and safety policy but will be required to register their details on the ESNZ database at no cost as part of our health and safety programme. Why do officials have to pay? As part of our insurance policy all officials have to be financial members of the organisation. This has been the case for a long time and is not new. It relates to judges, course designers, official stewards, and board members etc. I am a current life member do I need to pay a yearly fee now? No, your life membership will be switched to a full financial membership. However Life memberships will no longer be available for purchase as of 1st August 2014. When do I need a rider license? You will need this when you are competing overseas. You must also be a full financial member with ESNZ. The cost of a rider license is $50. This will run con-currently with your ESNZ membership (for example if your ESNZ full membership runs out on the 25th January, so will your rider license regardless of when it begins). Is there an overseas guest membership? No, all riders competing in defined levels (See membership structure) will have to pay a full membership fee. If competing below this level you can do this under an introductory membership. I want to compete at HOY, Can I register my equine fully but use Discipline casual starts? No only Equines with the specific ESNZ Discipline start can compete at HOY, No flexi starts. Do I need to be an ESNZ Introductory Member to compete in non-ESNZ disciplines such as breed classes or showing classes at the Horse of the Year show? No, all Horse of the Year participants wishing to compete in non-ESNZ disciplines such as breed classes or showing classes do not need to be registered with ESNZ under the new membership structure. I am competing this weekend and have not sent in my registration/membership in yet, will this get done in time? Our membership services team should be able to get this done for you, however if you require this within 3 days there will be a rush fee of $20 added to the total cost. Why does ESNZ spend money on a marquee at Badminton? This project is part of the High Performance programme to ensure owners of our international horses and supporters of our Olympic rated athletes are looked after at one event per year. This is important for them as they largely fund the success of these combinations. The hospitality is budgeted and paid through the high performance funding and is not a cost to the ESNZ Central budget.